The ‘Weeping Window’ poppy cascade of several thousand handmade ceramic poppies by artist Paul Cummins and designer Tom Piper will open on the 23rd May, at Carlisle Castle. The display will be on site until 8th July 2018 as part of the final year of 14-18 NOW’s UK-wide tour of the poppies. The poppies – 888,246 of them, one for every British and Colonial serviceman killed between 1914 and 1918, were first seen in 2014 displayed around the Tower of London. The presentations by 14-18 NOW, the UK’s arts programme for the First World War centenary, gives people across the UK the chance to experience the impact of the ceramic poppy sculptures in a range of places of particular First World War significance. The sculptures have already been displayed in 15 locations since the tour started in 2015 and viewed by over 3.75 million people to date. At the end of the tour they will become part of the Imperial War Museums’ collection. This is the final year of the poppies tour as it marks the centenary of the hard-fought closing months of the First World War. Carlisle Castle, which has military connections dating back to the eleventh century, is cared for and open to visitors by English Heritage and home to Cumbria’s Museum of Military Life. Weeping Window flows from the top of the keep, arching over the inner ward wall and cascading down into the outer ward, enabling visitors to view the sculpture from below for the first time. Carlisle Castle provided an H.Q. for the for the Border Regiment, one of the oldest in the British Army. A total of 23,000 recruits passed through the castle during the First World War, with the war costing the Border Regiment nearly 7,000 lives. The Regiment saw action in almost every theatre of war: France, Flanders, India, Burma and Gallipoli, Italy, Mesopotamia and Macedonia. Many Battle Honours were awarded to the Regiment, including five Victoria Crosses. 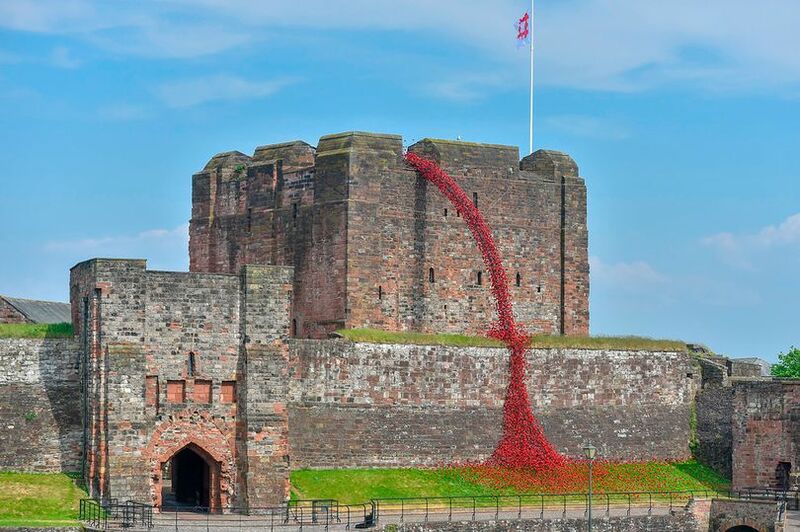 Jenny Waldman, director of 14-18 NOW, said: “The poppies have captivated millions of people across the UK and we are delighted to present Weeping Window at Carlisle Castle as part of the ongoing tour. Andrea Selley, historic properties director of English Heritage North, said the installation of the poppies had been “a true labour of love and an insight into the intricacies of building such a unique sculpture”.